← Madame Bovary, Miss Havisham and a February ending. The Harlem Shake sits atop the Billboard 100 since the end of February instead of at say, No. 15, because of the effect of YouTube. The video sharing social media platform has changed the way we experience music, thus indicating a strong influence of social on music. 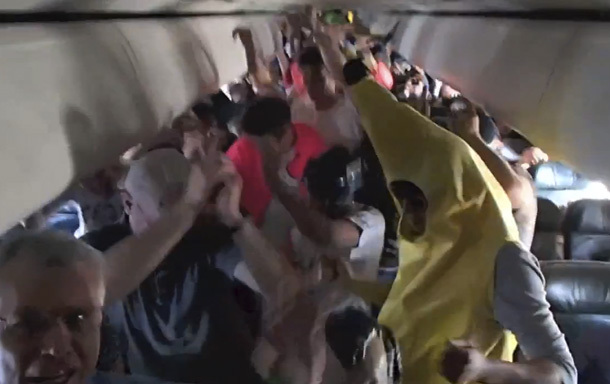 When students from a Colorado College took the Harlem Shake phenom to a ‘higher altitude,’ the American Federal Aviation Authorities became concerned and commentators started questioning how far people were willing to go to have their very own version of the skit. The Harlem Shake by Baauer has gone viral and become a pop sensation that groups from Australia to Zanzibar (not sure of Zanzibar for sure), companies from Pepsi to the local Mom and Pops, have all made videos dancing to the passionate, amazing, electro-hall beats. Unlike Gangnam Style, which became the first YouTube video to hit one billion views, Harlem Shake inspires people to make their own videos in their shops, offices, homes, libraries and on an airplane. The combined viewership is hard to get at but while Baauer was able to retain a certain level of copyright and in some cases get revenue from ‘copy cats’, “Gangnam style” was famously danced by celebrities including the UN Secretary-General, Ban ki Moon. Recently in Lagos, at its first Social Media Week, the impact of social in music was discussed. Artistes now deploy Twitter, Facebook, Instagram and most importantly YouTube to ‘drop’ singles, promote albums, burnish images and release videos. YouTube is threatening to ‘kill’ MTV and the talented singer can bypass the bureaucracies of the music label and achieve instant fame. YouTube has gone on to spin hits and inspire new cultural sensations a la Gagnam Style, Harlem Shakes, Azonto etc. Here in Africa, the once obscure dance of a fishing community in Ghana became an international sensation after YouTube videos of Sarkodie’s Azonto song and members of the Ghanaian national team dancing Azonto after scoring a goal at the 2010 World Cup went viral. Starting this February, Billboard.com has changed its ratings to include YouTube views in determining song chart positions; a very pivotal move but one which acknowledges that music has gone social. Of the three dance steps, Gangnam style with its asiatic roots, Harlem Shakes from downtown New York and Azonto from the Old Gold Coast which do you prefer? Methinks Azonto has got élan: by the way Africa is known for the dance. This entry was tagged Azonto, Baauer, Ban ki Moon, Billboard, Gangnam style, Harlem Shake, Lagos, Social Media Week, YouTube. Bookmark the permalink.